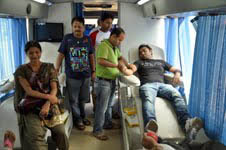 Members of Orissa Society of Electronic Media (OSEM) donated over 50 bottles of blood on October 07:in a camp at Soochana Bhavan, Bhubaneswar. Information minister Mr. Arun Sahu and Khurda M.L.A. Mr Rajendra Sahu were present at the camp along with OSEM patrons, Prasanta Patnaik, Sampad Mohapatra and D.N. Singh. President of the organisation Amiya Pani along with Sabyasachi Panigrahi and other members conducted the camp under Bhubaneswar Blood Bank’s active cooperation and guidance. 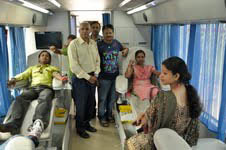 A number of ladies also donated blood. This was the second blood donation camp organized by OSEM. 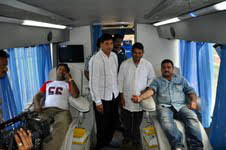 Last year it has organized a camp on 1st October 2011, the World Blood Donation Day during which over 100 bottles of blood were collected. The OESM has kept a target to collect more blood in the coming years. Besides organizing mass blood donation camps, members of OSEM also donate blood to needy and poor patients liberally as and when required.